10 S. Chestatee St., Unit "F"
Located just a short hours drive north east of Atlanta, and a short drive from Lake Lanier is the picturesque Alpine village of Helen, Georgia. The town is in the foothills of the Blue Ridge and Great Smoky Mountains just south of the beginning of the Appalachian Trail. Hikers and tourists alike come to visit nearby Unicoi State Park and the beautiful Anna Ruby Falls. The Chattahoochee River runs right through the center of town providing great fun for tubing fans! In the middle of this quaint alpine village is our Glassblowing Shop. Our master Glassblower, Scott Warner, a fourth generation "flameworker", is always ready to provide an educational, as well as informational, demonstration showing his glass sculpturing techniques for all to enjoy. Come visit our unique shop and enjoy the beauty both inside and out! We encourage intelligent touching and of course, children are always welcome! Home to the Nations first gold rush, Dahlonega, Georgia is located one hour north of Atlanta in the scenic foothills of the Blue Ridge Mountains. 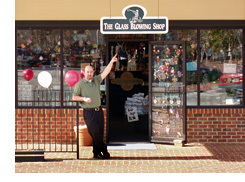 Fourth generation glassblower Chris Kennedy opened the shop in 1998, locating it on the historic square just across from the town's Gold Museum. We have daily 'flame-work' glassblowing demonstrations and offer a wide range of handmade treasures from icicles & barometers to pendants & personalized names in glass. So come visit our beautiful town and stop by and let us find something just for you. The Glassblowing Shop in New York State is located in the beautiful Adirondack Olympic village of Lake Placid. Lake Placid hosted two winter Olympic games, one in 1932 and the second in 1980. The village offers a variety of Olympic related sites, as well as many other sports and recreational activities. 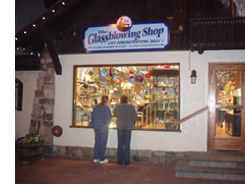 The Glassblowing Shop opened here in 1999 and is located on Main Street in the Alpine Mall. We offer our guests daily "Flame-work" demonstrations and, as in all of our shops, children are always welcome. As one of Lake Placid's visitors you can enjoy its rich history and be assured of a warm and friendly welcome from The Glassblowing Shop.